Acne, is a skin condition commonly associated with teenage years, it is estimated that 80% of us will have acne at some point in our lives. It will commonly start with adolescence, but many will have acne in their 20s, 30s, and even 40s and 50s,” In some women it can continue throughout their entire life. Acne which is very often caused by hormones, with increased harmful bacteria, leading to oily skin, blackheads, whiteheads and inflamed spots. 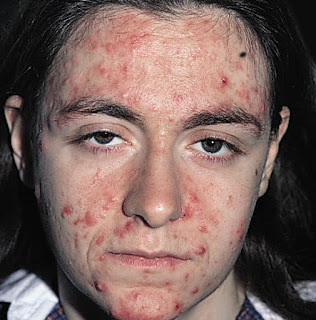 The condition is sometimes associated with stress, certain medicines, acne-forming creams and cosmetics or pregnancy. Grade one – mild: You suffer from occasional red spots, blackheads, whiteheads and mild oiliness, usually on your face. Grade two – moderate: You have inflamed red sports on the forehead, nose and chin. 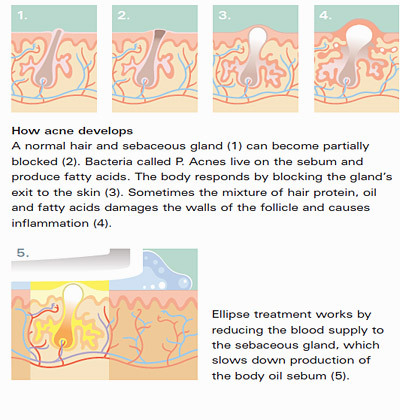 Grade three – severe: You will have inflamed spots are frequent, as are blackheads, whiteheads and skin oiliness. Grade four – very severe: You have inflamed spots become swollen and painful and can lead to scarring. Grade five – extremely severe: You have larger, painful red nodules, which go deeper into the skin and are likely to leave scars. Grade six – most severe: You will in addition to nodules and bumps, you also have burst nodules under the skin result in cysts. 25% of people with acne will never seek a consultation and will use non-prescription products or give up on treatment altogether. Whilst no single acne treatment works for everyone, you should seek medical advice as soon as possible, particularly if your acne is grade three or four. Avoid harsh cleansers and toners containing alcohol which will only strip the skin causing the skin to produce even more oil. Look for oil-reducing cleanser; look for over-the-counter treatments with salicylic acid, to exfoliate skin and clear blocked pores, and niacinamide, to reduce oiliness. If these do not work, you may need a prescription from a doctor. This is particularly important if your acne is getting worse, leaving scars or marks, your skin is making you unhappy or your spots are affecting your social life or work. We see very good results from Clients using the SkinCeutical Blemish & Age range . This line addresses the issues of skin ageing prone to breakouts. It is a product line that can be used by teens or adults. Blemish + Age Defence is a targeted, oil-free approach for ageing skin prone to breakouts. This first-to-market acid blend combines 2% dioic acid with an optimal alpha- and beta-hydroxy acid formulation to reduce the formation of acne and clogged pores, while improving the appearance of fine lines, wrinkles, and uneven skin tone. Topical applications including gels, lotions and creams featuring ingredients such as salicylic acid, benzyl peroxide, niacinamide, azelaic acid, antibiotics and vitamin A-derived retinoids. Tablets including oral antibiotics and even the contraceptive pill. Also the diuretic spironolactone, which reduces androgen, a hormone that stimulates the oil glands in the skin. This is shown to be effective but as with all medication there are some side effects. Finally, you can get an isotretinoin, a vitamin A-derivative, called Roaccutane. Clinic treatments including jet peel, suction microdermabrasion, chemical peels, LED,laser and intense pulsed light and photodynamic therapy. Treating acne usually starts with the topical treatments and working up to the most dramatic option, Roaccutane. Like any drug, this has a number of side effects that must be weighed up and monitored; however, it has been shown to be successful in clients whose severe inflammatory acne has not responded to other treatments. Book a consultation with one of our skin Therapists and they will advise as to what is the best treatment for you.